Luckily for Washington growers, lightning did not strike twice in the same place this year. The near average March to May temperatures during the spring of 2012 are in sharp contrast to the record cold that was observed last spring. As a result, crops are generally faring well statewide, with minimal frost or weather-related damage being reported. There were several heat waves in 2012 that provided glimpses of summer that were entirely absent last spring. 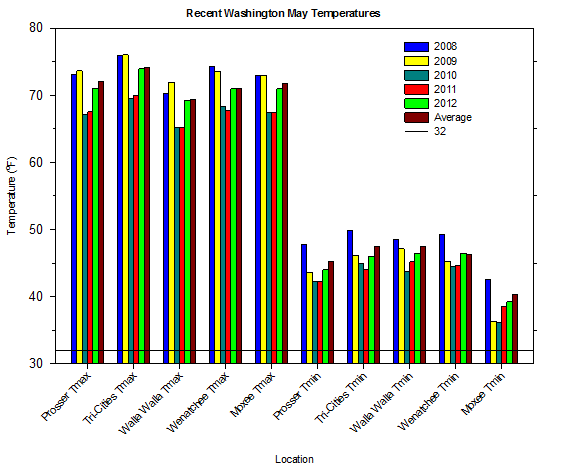 The hottest temperatures recorded this year during April at locations such as Moxee, Moses Lake, and Wenatchee (WSU TFREC) were warmer than the monthly maximum temperatures for June of 2011, even though June is typically fifteen degrees warmer than April! The temperatures during the April 23rd heat wave were more typical of July than of spring. A second notable heat wave in mid May brought temperatures into the low 90s in many areas that failed to reach 80 degrees at any time last May. Even Vancouver reached 86 degrees this May, after barely topping 70 degrees in May of 2011. Despite periods of heat, there were also several spells of unsettled and cool weather during the spring temperature roller coaster ride. March was slightly cooler and wetter than normal, while April was warmer than normal, and May was slightly cooler than normal. May featured typical spring weather variability and temperature fluctuations, along with slightly below average temperatures. Unsettled and moist conditions early in the month transitioned to much drier conditions during the second week of May, which persisted into the middle of the month. The clear and dry weather led to a period of temperature extremes. Temperatures fell to 27 degrees at Moxee on May 10th, and to 25 degrees at Pullman on May 11th. Although most locations remained just above freezing during May, Moxee and Pullman recorded seven and five frost nights during the month, respectively. Cold morning temperatures around May 10th quickly became summer-like high temperatures a few days later. By May 13th, Vancouver recorded a high of 86 degrees. The warmest weather of 2012 arrived around mid month, as many areas in central Washington reached the low or even mid 90s on May 15th. Cooler and breezy weather around May 22nd brought rain to many areas, as well as high temperatures only in the 50s in western Washington and Pullman. Snow fell around Mt. Rainier, with over six inches reported at Paradise. Overall, cool and unsettled weather in the early and latter portion of the month was punctuated by a dry period of temperature extremes around the middle of the month. Compared to last spring when the mean and average high temperatures at Prosser (WSU IAREC) broke their previous cold records by 1.3 and 1.6 degrees, temperatures this spring felt rather mild. The average May temperature was 3.6 degrees warmer than last year, while the average seasonal temperature was 3.3 degrees warmer than the spring of 2011. Most locations around the state observed slightly below average temperatures in May, and near average temperatures for the spring season. 2012 also observed a marked increase in the number of warm days. For example, Mt. Vernon rose above 60 degrees on 18 more days in April/May of 2012 than in 2011, and also recorded seven days in May above 70 degrees, after failing to reach 70 degrees last May. It was a similar story east of the Cascades, as locations from Omak to the Tri-Cities observed up to two additional weeks with temperatures above 70 degrees during April and May of this year compared to 2011. Many of these same areas that failed to surpass 80 degrees last spring experienced up to 7 days with highs in the 80s this spring. Despite the heat wave of late April, May began with somewhat unsettled conditions and below normal temperatures, as cool Pacific storm systems brought rain and wind to the region, along with snow to parts of the Cascades. Thursday, May 3rd was especially rainy and cool in western Washington, with highs only in the low 50s, and up to one inch of rainfall. One foot of snow fell at Paradise, Mt. Rainier. Warmer conditions returned over the weekend of the 5th and 6th, as temperatures returned to near normal. Sunshine and above normal temperatures on the 7th and 8th yielded to a dry cold front passage on the night of the 8th. The marine surge of air cooled areas from west to east. Very little rain fell in association with the frontal passage, although westerly winds increased the flow of cooler, drier air into the region. Scattered frost occurred on the mornings of the 10th and 11th, with low temperatures of 27°F at Moxee on May 10th, and 25°F at Pullman on May 11th. Warmer air returned on Friday, May 11th, and temperatures in central Washington climbed into the 80s to around 90°F on the 13th. Temperatures reached 86°F in Vancouver, and 84°F at Montesano, which is between Olympia and the coast. A warm air mass aloft combined with dry and stable conditions created a wide range in low temperatures that varied from 60°F at Wahluke Slope to 32°F at Broadview (Ellensburg) on Sunday, May 13th. May 14th was another hot day, with most areas in the 80s and 90s, except for a cool 59 degrees in the ocean air at Long Beach. Low temperatures warmed into the mid to upper 60s in some typically warm overnight locations like Wahluke Slope and Parker. Slight cooling moved into western Washington on the 15th, while eastern Washington remained hot. May 16th was much cooler in interior western Washington, with highs in the 60s to low 70s, while south central Washington cooled only slightly into the low to mid 80s. Additional cooling brought more seasonal temperatures to eastern Washington on the 17th and 18th, with slightly below normal temperatures in western WA. Some areas recorded lows around freezing on the morning of May 19th. Warmer temperatures returned for the weekend, with continued dry conditions on Saturday, May 19th. The rain that returned to western Washington on Sunday, May 20th signaled a pattern change. Wetter and stormier conditions were felt statewide on Monday, May 21st, bringing the first notable rain in several weeks to much of Washington. Strong winds on the 21st and 22nd heralded the return of cooler and unstable air, as the jet stream dipped south of the region. Winds gusted to nearly 40 mph at St. John. The AgWeatherNet site PK_McClenny (east of the Tri-Cities) recorded 0.72 inches of rain on May 21st, while many AgWeatherNet locations in western Washington recorded one to two inches of rain during the May 21st/22nd storm. Clouds, rain, and cool air kept many areas of south central Washington around 60 degrees for highs on May 22nd, while western Washington and the Pullman area recorded highs only in the mid 50s. Significant snow fell in parts of the Cascades, including 6+ inches around Mt. Rainier. Warmer and drier weather returned on May 25th and 26th, as unusually strong and dry northeasterly winds impacted eastern Washington. Slightly cooler weather occurred at the end of the month. As expected, the diurnal temperature range varied greatly throughout the month. Large differences between highs and lows occurred around mid month due to generally clear, dry, and stable conditions. Unsettled conditions during the fourth week of the month were characterized by much smaller diurnal ranges due to cloudy, windy, and moist weather. The average May temperature at Prosser (WSU IAREC) was 58.7°F, which is 0.9 degrees below the long term average. The average high was 71.1°F, which is 0.9 degrees below average, while the average low was 44.0°F, which is 1.3 degrees below average. Despite being slightly cooler than average, the average high, average low, and mean temperatures in May were 3.6, 1.7, and 3.6 degrees warmer than last May. The daily high temperatures varied from 90.3°F on May 14th to 59.0°F on May 2nd. The daily low temperatures varied from 58.1°F on May 31st to 32.5°F on May 5th. Daily average temperatures varied from 73.5°F on May 15th to 48.8°F on May 5th. 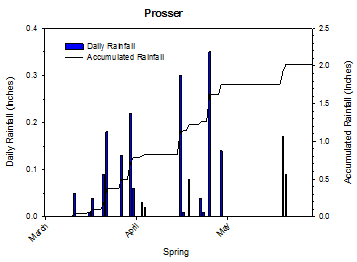 0.26 inches of rain fell at Prosser (WSU IAREC) during the month, which is 0.38 inches below the average of 0.64 inches, and 1.1 inches less than the rain observed during the wet May last year. The average wind speed was 5.1 mph, and the average 8 inch soil temperature was 63.5°F. May 2nd: The high temperature at Long Beach rose to only 50.6 degrees. May 3rd: 0.8 inches of rain fell at Long Beach. May 13th: The temperature at Vancouver rose to 86 degrees. May 15th: The temperature at WSU Tri-Cities rose to 92.5 degrees. May 22nd: The high temperature at Underwood was only 51 degrees. 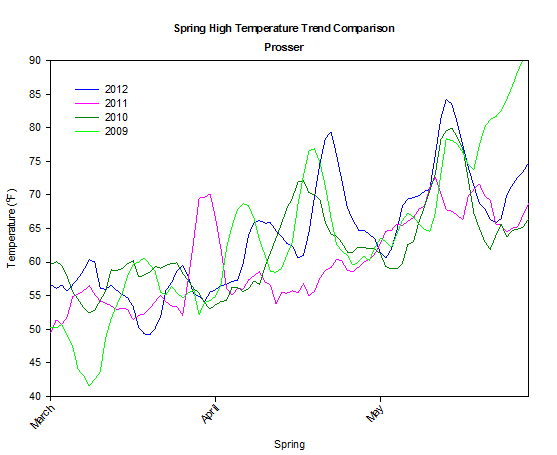 The line graph shows the spring trend of smoothed daily high temperatures at Prosser (WSU IAREC) for 2009 to 2012. Due to an absence of warm days, 2011 featured much less weekly temperature variability than other recent years. The weather in March was wetter and slightly cooler than average in Washington, as a persistent southwest flow fed moist air into the northwest from the Pacific Ocean. Temperatures during the day-time were particularly cool due to periodic clouds and rain. Record monthly rain fell in some areas. 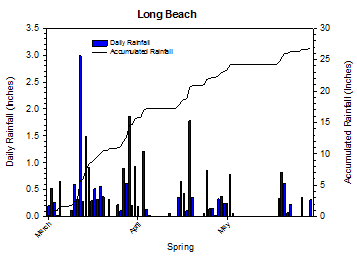 Long Beach recorded over fifteen inches of rain for the month, along with only five rain free days. A strong area of low pressure brought 3 inches of rain to Long Beach, along with snow to some coastal areas on March 12th. Snow also fell on March 21st in eastern Washington around Pullman and Spokane. April was generally warmer than average across the state. Prosser (WSU IAREC) recorded the warmest April average low temperature since 1994, and the warmest April overall since 2000. Average high temperatures were seven degrees warmer in 2012 compared to 2011. The highlight of the month was a notable heat wave on April 23rd that brought record breaking temperatures of nearly 90 degrees to south central Washington. Thunderstorms on April 23rd brought rain and wind gusts up to 70 mph at St. John. Heavy rain on April 26th combined with significant snowmelt to produce high stream flows on many area rivers. In fact, all 138 AWN stations reported rain on April 26th. Overall, April featured a greater variety of weather than was seen last year. 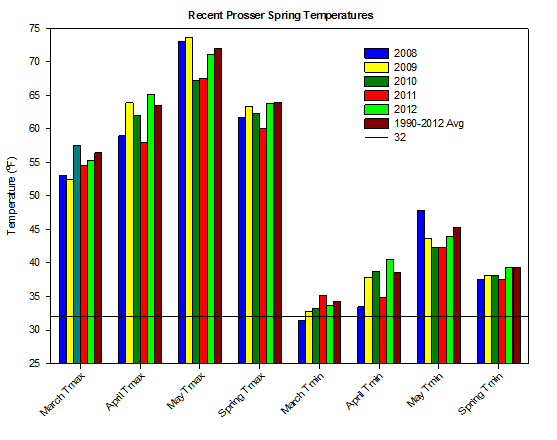 The average spring temperature at Prosser (WSU IAREC) was 52.2°F, while the seasonally average high and low temperatures were 63.8°F and 39.3°F, respectively. All of these values are essentially average for spring. Overall, it was about 3.3 degrees warmer this year compared to last spring. The warm April served to balance slightly cool March and May temperatures. The warmest high temperature recorded during the spring was 90.3°F on May 14th, while the coolest high was 41.4°F on March 21st. The warmest low temperature was 58.1°F on May 31st, while the coldest temperature was 22.0°F on March 19th. Daily average temperatures ranged from 73.5°F on May 15th to 34.6°F on March 6th. 2.02 inches of rain fell during the spring season, which is slightly above the average of 1.85 inches. However, this is 0.8 inches less than the total from last spring. Somewhat wet conditions during March and April compensated for the dry May. The average wind speed was 6 mph, and the average soil temperature (8 inch depth) was 53.9°F. March 9th: The temperature at WSU Tri-Cities rose to 72.6 degrees. April 7th: The temperature at Broadview (Ellensburg) fell to 18 degrees. May 3rd: One foot of snow fell at Paradise on Mt. Rainier. March: Slightly cooler than average and wet. May: Slightly cooler than average. Grain seeding was essentially finished in Washington as of May 20th, while alfalfa hay cutting continued across the state. The fruit crop was developing well in the Yakima Valley, with apples and cherries featuring a very good set. Potatoes, corn, and grass were planted in mid May in Whatcom County during ideal weather conditions. Cereal grain crops in Adams County have looked better than they did in 2011. The winter wheat crop was behind in growth and in need of moisture in Chelan and Douglas Counties. Overall, crops fared well with minimal freeze damage reported in most areas. As of late May, Washington crops were in good shape overall. Yakima Valley tree fruit was progressing well, and spring and winter wheat was healthy, while a flushing of new growth on Fir trees was reported by Christmas Tree growers (National Agricultural Statistics Service). The April 1 to May 31 Accumulated Growing Degree Day (GDD Base Temperature 50°F) value at Prosser (WSU IAREC) was 379, compared to a 2008 to 2012 average of 301, and a 2011 value of 170. On May 15th, 2011, an unusual spring rainstorm dumped over one inch of rain at Moxee and Wenatchee (WSU TFREC). On May 8th, 1999, the temperature dropped to 21.9 degrees at Moxee. According to the Climate Prediction Center (CPC), wetter than normal conditions in June will transition to drier than normal conditions by midsummer in Washington. Generally, near normal temperatures are anticipated, although cooler than normal conditions are possible for Washington during June, while warmer than normal temperatures are possible for eastern Washington during the late summer and early autumn time period. There is a 50% chance that ENSO neutral conditions this summer will transition to El Niño conditions during the autumn, and an El Niño alert has been issued by the Climate Prediction Center (ENSO Alert System Status).